Sit down on a sprung-loaded seat that is adjustable to all heights. Turn the key and the engine starts. All the controls are close at hand: forward/reverse drive lever, hydrostatic drive, central cutting height adjustment, blade clutch and bow handle for effortless emptying of the grass catcher box. The single-pedal self-propulsion ensures a previously unimagined level of comfort during driving and manoeuvring. The forward/reverse drive switching developed by STIHL ensures fast working. Thanks to the simple reversal mechanism, the driving direction can be selected using the drive direction lever. The hydrostatic gearbox is controlled via the drive pedal on the right. The electromagnetic blade clutch makes blade activation easy. The mowing deck is simple to activate with a button press on the touch panel; pressing the button again disengages the blades. Comfortable single-pedal self-propulsion with hydrostatic gearbox. Central cutting height adjustment: The lever for centrally adjusting the cutting height is located immediately next to the seat, allowing the cutting height to be adjusted as required from level 1 to 8. 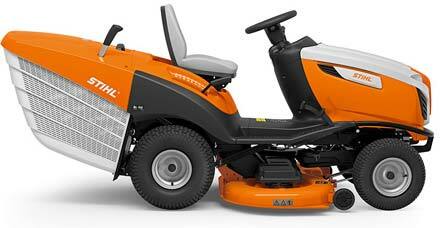 The mowing deck with a 2-blade system and angled blades provides a clean and neat cutting pattern over a width of 95 cm. The mowing deck can be removed without tools. The “dumper-design” grass catcher box can be emptied effortlessly from the driver’s seat by means of a bow handle. The grass catcher box design ensures optimum filling. No clippings are left behind after emptying.